South Africa’s gifted left-hander shows steel (and rides his luck) as the competitive Pakistanis are finally tamed. 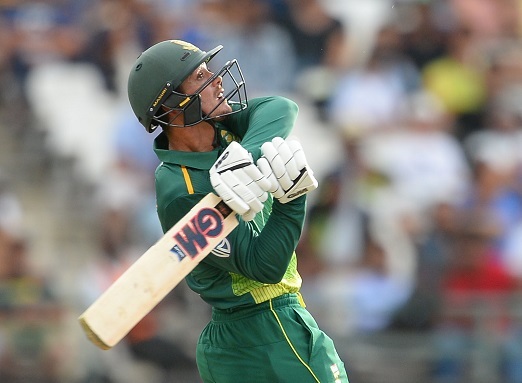 Quinton de Kock showed the type of big match temperament the Proteas will need so much of if they’re going to go have a decent tilt at World Cup glory later this year with a brutal, match-winning innings in the fifth and deciding ODI against Pakistan at Newlands on Wednesday night. The gifted left-hander laughed in the face of history with a spanking 87 off just 58 balls that guided the hosts to a comfortable seven-wicket victory, meaning they gain a last-gasp 3-2 series win. By the end of it all, one wondered what the fuss about the target of 241 was all about, but it was genuinely a concern initially. It was, after all, a record chase in 30 ODIs under lights at the famed venue. De Kock was compelling to watch, especially the way he deposited three deliveries over the boundary. Yet Pakistan will wonder what could’ve been had he not been given a life when he only had 12. Trying to pull a Usman Shinwari ball outside off, De Kock only managed to get a leading edge to cover. The catch was taken, but the replay showed Shinwari had overstepped for a no-ball. He was finally caught in the deep, but by then South Africa had reached 146 in just 20.5 overs. That allowed Faf du Plessis and the impressive Rassie van der Dussen to both serenely reach unbeaten 50s to finish the job. Earlier, Andile Phehlukwayo and Dwaine Pretorius’ friendly duel played an instrumental role in restricting Pakistan. Potentially competing for one spot in South Africa’s ideal World Cup combination, the duo did little to provide clarity on who should be picked. Brought in for franchise teammate Beuran Hendricks, Pretorius showed skill and control in claiming 2/46 in 10 steady overs. The Highveld Lions star struck a key blow when he castled the dangerous Babar Azam (24) after the stylish strokemaker went too far across his stumps. He followed it up with the wicket of Mohammad Rizwan. Phehlukwayo, who claimed career-best figures in the 2nd ODI in Durban, also recovered from two lukewarm outings to boast figures of 2/42 in nine overs. By all accounts the 22-year-old had even more of an influence, snapping up the scalps of two kingpins, Fakhar Zaman – who top-scored with a fluent 70 – as well as the experienced Mohammad Hafeez. Pakistan’s total could’ve been lower had the Proteas’ catching not let them down again, with Hashim Amla dropping Fakhar at slip on 20. Overall, South Africa backed up skipper Faf du Plessis’ decision to bowl first, with only a sprightly, unbeaten 47 off 31 balls helping add some respectability to the score.